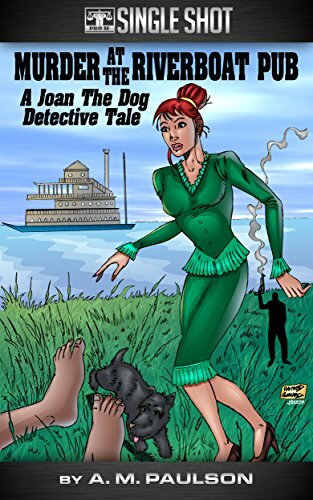 ‘MURDER AT THE RIVERBOAT PUB: A JOAN THE DOG DETECTIVE STORY’ DEBUTS FOR 99 CENTS! Debuting originally in PRO SE PRESENTS, the most unusual detective of all returns in an all new story as a Pro Se Single Shot! Joan, the feisty and smart Scottish Terrier with a penchant for crime solving, and Eve, her human, stumble literally upon a body and murder in 1870s small town Louisiana. Old scars heal slowly, especially those caused by the Horrors of the War Between the States, and this becomes evident when an argument breaks out and ends in a murder. Due to her intelligence and unique skills as a dog, it is up to Joan to lead Eve and others to the solution of this mystery before death comes calling again, this time perhaps for a dog! MURDER AT THE RIVERBOAT PUB: A JOAN THE DOG DETECTIVE STORY by A. M. Paulson. A Single Shot Story from Pro Se Productions. Featuring a fanciful cover by Raymond Leonard, logo design by Jeffrey Hayes, and digital formatting by Antonino Lo Iacono and Marzia Marina, MURDER AT THE RIVERBOAT PUB: A JOAN THE DOG DETECTIVE STORY is available now at Amazon for only 99 cents at https://www.amazon.com/Murder-Riverboat-Pub-Detective-Story-ebook/dp/B01MYCS8UM/ref=sr_1_1?ie=UTF8&qid=1492116662&sr=8-1&keywords=murder+at+the+riverboat+pub. Joan’s first Single Shot is also available for most digital formats on Smashwords athttps://www.smashwords.com/books/view/699683.